A blend of natural oils & waxes offering exceptional durability and resistance for doors, stairs, flooring, worktops and most wood surfaces subject to a high degree of wear. Produces a satin/matt water-repellent and tread-fast finish. Easy application with no sanding between coats, and to maintain or renovate, simply re-apply. Ensure all surfaces are clean, dry and free from any previous finishes. For BARE WOOD, rub down with a fine grade sanding paper and remove any dust carefully. For FINISHED WOOD, remove all existing finishes, clean with white spirit and sand to a uniform appearance. Allow to dry thoroughly. 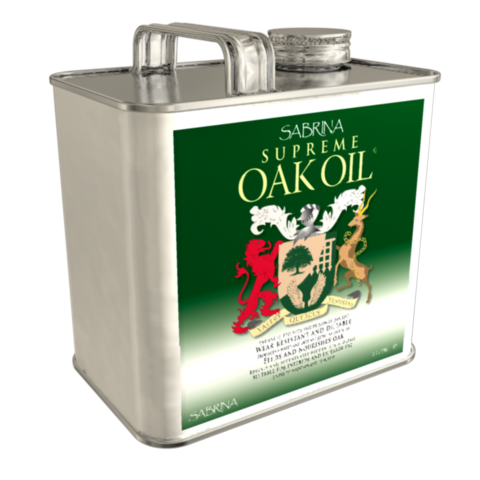 Sabrina Supreme OakOil© is ideal for naturally enhancing looks and durability. Shakecontents thoroughly before use, and apply in a warm, well ventilated area. Apply thinly using a good quality bristle or synthetic brush and lay evenly, following the direction of the grain. Leave to dry thoroughly (12-18 hours). Apply a second coat if necessary, leave to dry and buff to desired sheen level. A single application will cover approximately 12-15 square metres per litre, depending on the density of the substrate.